We traveled to within a few kilometres of the 60th Parallel North, daylight starting around 4:30am and ending around 10:30pm. The nights extremely short, so not ideal for seeing the Northern lights, but this did not deter us from trying. Despite the icy cold, we had spectacularly sunny days all week. Experiencing the wilderness of Juneau, Skagway and Glacier Bay left me craving more, longing to venture further north and staying longer. We watched a documentary on the Alaskan interior and eskimo history and I was overwhelmed with emotion…the beauty, harsh wilderness, human tenacity and the realisation that this is where the world still is largely as God originally made it, untouched by man’s greed. There are 100,000 glaciers in Alaska and we experienced a few. In Juneau we hiked to Mendenhall Glacier and in Skagway we took a boat across Chilkoot Inlet, then a bus to a camp in the spruce forest, hiked to a river, canoed to a lake in the Tongas National Park, then hiked some more across silt left by the retreating glacier, to eventually stand on Davidson Glacier. We revelled in Alaskan experiences: sang with a cowboy in the Red Dog saloon in Juneau, sampled spruce tip beer in Skagway and marvelled at the tidal glaciers of Glacier Bay, where huge chunks of ice break off into the ocean. We noticed ice flows drifting past when we woke in the morning and a few hours later stood watching in awe as pieces of the Grand Pacific Glacier smashed into the ocean with a roar. The John Hopkins and Reid Glaciers were just as spectacular. I shouted: “Whales!” and we all stood up and gathered at the window to see a pod of Orca, blowing and showing off their white bellies as they surfaced, then dived. This is how the conversation with Lisa started, this shared experience and excitement created a type of intimacy that got us really talking. We had been lying on loungers in the Spa, which has a 180 degree view of the ocean and we had been discussing the wildlife we’d seen: sea otter, sea lion, whales, a pod of dall porpoises (which look like mini Orcas! ), bald eagles, wild mountain goat, porcupine and a myriad of bird life on the ocean… but as yet no Orcas. It was not very long after saying how much we would really love to see Orcas, that we actually got to see them! 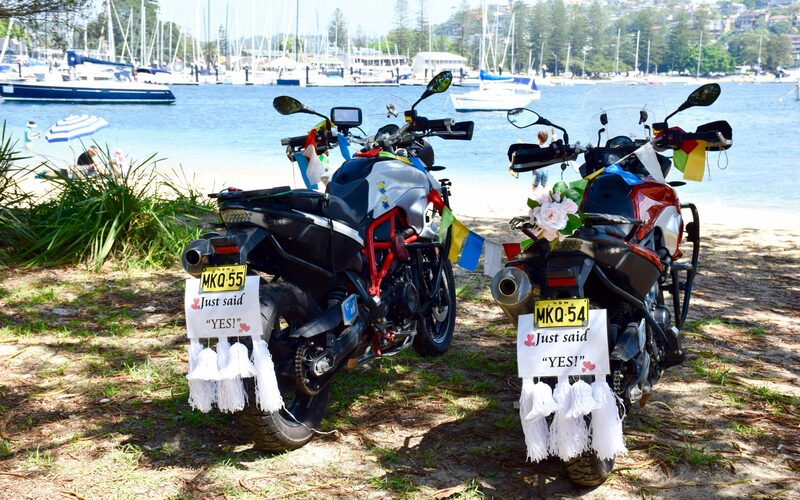 Lisa was very excited to hear about our journey on the bikes, our focus to “just say yes” and shared that she felt destined to meeting Paul and I. She went on to explain: She had been a doctor in Russia but when she arrived in the US with a paltry $500, she needed to find another way to make a living. She had built a new life and had not stopped working, until this trip which was to eventually rest after a life threatening illness. Her husband has been asking her to stop working, but she has felt unable to do that, because of fear that she may never be able to work again. She acknowledged how irrational her fear is, in light of their financial security and that she had been meditating on that reality during this journey. We spoke at length about fear, about our health …about love, time and opportunity. Lisa shared that meeting Paul and I had encouraged her about exploring new possibilities. With people from over 60 countries on the cruise, we enjoyed many interesting conversations – asking people about their countries, their lives and their views. It has proved a powerful approach, telling a stranger that we do not have a point of view on their local affairs, that we are simply curious to hear about their reality and their thoughts. A conversation that stands out for me as most thought provoking was with Dave from the conservative South – he voted for Trump and whilst he’s concerned about a few things Trump says, he’s confident that he backed the right candidate. He appreciated us just listening …to his story, his concerns and his hopes. Dave believes that ultimately all we really need to do in this world to ‘repair the mess’ – is to take time to truly listen to each other and try to understand. Previous postWelcome to the USA! So now I say ”I see a $Billion US in my savings account”, & wonder how long it’s gonna take to get there . . ?